ok... since apparently I'm not going to be Bill Gates when I grow up, when I do get old, I want to be this guy!! This is an interesting demonstration of ragdoll physics. You can drag her around and let go. I don't know how accurate the physics model actually is, but it does make for an interesting example. Interesting proposal, although I don't see it getting very far. Any of you uber-geeks ever use SphereXP? http://www.hamar.sk/sphere/ I'm considering trying it, unless someone fills my head with horror stories. YES!! I've got my registration confirmation in hand. *Happy Dance* I'm goin to Meltdown!!! Yeah! Finally Visual Studio 2005 launch date was announced at VS Live and we should be getting our hands on final product on Nov 07, 2005.
wow... more good words about HA! Looks like I better stick to my release schedule. about my little pet project... Heroic Adventure! This is PURE MOTIVATION for me to keep plugging away! I've got a few more years to go before I need to start worrying about this one. more good words about HA! Good feedback (ok... any feedback) is always appreciated! 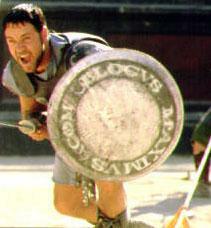 I asked a few of my friends to come up with cool imagery or fansigns for Blogus Maximus. This is the first one, and it's gonna be tough to beat. Thank you Jason Olson! You totally rock!! Of the three submissions, #1 & #2 were both appealing. No mention of #3 at all. #1 (the Home Automation book) may be overlapping with another project they have in the works, they are looking into it. #2 (one of the Game Programming books) was the most appealing to them and they have requested more info from me to "kick things off". I submitted 3 book proposals yesterday (2 on Game Development, 1 on Home Automation). There was a giant turkey there too, but it's not in these pictures. It's like the geek “clown-car”. BTW, the guy driving is yours truly. Anyone posting long code samples to the main feed, please follow Aaron Rosenfeld's excellent example. After talking to Laura (www.shutuplaura.com) Hunter at the MVP party last night, I figured www.blogusmaximus.com was surely taken. Well... lo and behold, it is now... by yours truly! Fill in the grid so that every row, every column and every 3 x 3 box contains the digits 1 through 9. As someone who has started two .NUGs so far, I'd be happy to offer any help to get the ball rolling. Drop me a line after Tech*Ed and I'll hook you up. Man... if I could have snagged that acronym for our South Carolina group (GC.NUG) I would have! Will there be free wireless internet in the Convention Center (and wherever else) at Tech*Ed? I tend to overpack, not clothes, but just "stuff" and Jeff's post here: packing tips has me a little worried. This is my first Tech*Ed... do they really give away that much swag? ?